Amazon's early Black Friday deals blitz continues with a deep discount on the SteelSeries Rival 600, one of the best gaming mice available (and one that ranks very highly on our guide to buying the best gaming mouse). The Rival 600 already feels underpriced at its £79.99, so cutting that price in half makes it damn near irresistible. It's a precise, comfy mouse with a bunch of handy additional features, most notably a dedicated depth sensor that eliminates unnecessary or unintentional movement when you pick up the mouse (something gamers do a lot of, particularly in shooters and action games). 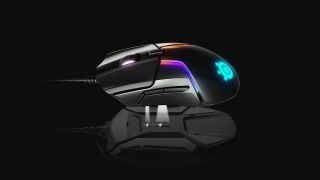 It's also got a great package of adjustable weights to shift the center of gravity and tailor it perfectly to your hand and robust RGB lighting if like your peripherals to come with flash as well as substance. At £39.99 this is a can't-miss. If you're looking for a gaming mouse and don't way to spend loads on something in the ultra-premium range, you should jump on this deal immediately. If you're looking for a great deck to pair it with, don't miss our buying guide to the best gaming keyboard. And for something to play with your brilliant new tech, have a look at the best PC games you play right now.